Description: CSX SD40-2 8095 and GP40-2 6471 in CSX's Osborn yard in Louisville KY on April 10, 1999. Description: With a short train C777 creeps up the Northern at 2:14 PM. Description: Hauling a long mixed freight west on her ex-B&O mainline at Pine Junction. 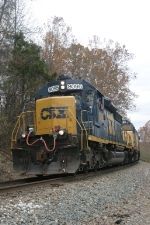 Description: CSX 8095 brings a train east at Little Falls. Description: The majority of shots I took in the summer, of 2005 and the end of 2005. Can you tell which image I got a new camera with? Description: K357-5 westbound at 10 mile road in South Lyon. Description: YN3 scheme SD40-2 rolls west on track 1 of the Trenton Line under the northeast corridor with CSX unit trash train K207 on a sunny morning. 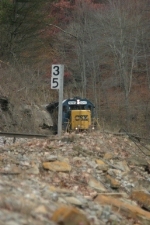 Description: Q327-06 starts to go after waiting for Q326 (In the siding) to pass him. Description: The CSX rock runner train K943 conductor directs the engineer how far forward eastbound to go to clear the switch at Carroll amongst this trio of B&O cpl signals. Description: Santa Train logo on the side of 8095. 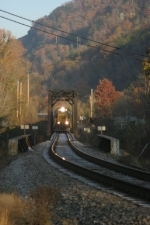 Description: Resting after bringing the 2007 Santa Train into Kingsport. Description: The 2007 Santa Train has ended and now the train is resting in the yard.